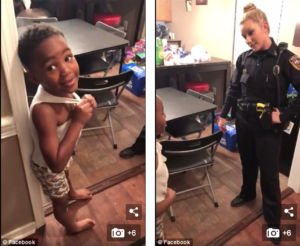 ‘I want y’all to come back to my house and take him to jail‘: Mississippi boy, five, dials 911 to report that the Grinch is trying to steal Christmas…. and the cops show up to his house! I invited him for eight o’clock, but he didn’t show up until 9.30. How many people showed up to the meeting? He showed up late for the meeting. He was rude and unhelpful and always showed up late to work. I was a bit alarmed at/by how much weight she’d lost. I was alarmed to hear that she was coming. I’m rather alarmed that we haven’t heard anything. Don’t be alarmed: it wasn’t a serious accident. I was alarmed to see that the men were carrying guns. A five-year-old Mississippi boy called 911 to report that the Grinch was trying to steal Christmas. 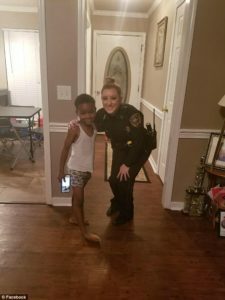 Bryam, Mississippi, Police Officer Lauren Develle rushed to Tylon Pittman’s house to assure him that Dr. Seuss’s Grinch wouldn’t bother his Christmas on Saturday night. ‘I can NOT make this up!!! My 5 year old brother called the police and said that the Grinch is stealing people Christmas and he don’t want him to steal his so they really came to our house,’ said brother TeDera Dwayne Graves, who was home for the holidays from the Air Force. ‘Our dispatcher posted a status on Facebook that she had received a call from a little boy … and he told her he thought the Grinch was going to be coming to steal his Christmas,’ the police officer said to The Clarion Ledger. The two situations are quite different. The colours almost match but not quite. I enjoyed her new book though it’s not quite as good as her last one. I was feeling quite tired after our walk. They said the dog was quite badly injured. Everyone always asks us, what are the funniest status updates? Develle said she grew up loving the character created by children’s author Dr. Seuss. ‘I kind of find it really funny. … Every Christmas morning, my dad wears these Grinch pants,’ she added. 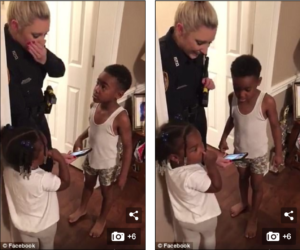 Assuring the boy that the Grinch would not steal his Christmas, Develle listened as Tylon shared that he had seen the video on Facebook and that he watched plenty of videos about the Grinch. ‘So what are you going to do if he tries to steal your Christmas?’ Develle asked TyLon. His mom was still in disbelief that her son really thought the green villain was going to take all of his presents. TyLon has a plan in case the Grinch does appear: he says he will wrestle him and hold him until the police show up. “I’m going to say put your hands behind your back and get down on the ground, then when he gets on the ground, I’m gonna say, ‘Why are you stealing Christmas?’ ” he added. TyLon wants to become a police officer and doesn’t seem to be too far off from accomplishing his dreams. Liz stared at us in disbelief as we told her what had happened. He shook his head in disbelief when I told him about the crash.